Susantha Premakumara, 33, a money lender of Moragahahena, off Horana, was on his motorcycle going to his ancestral home in the same village, last Sunday, accompanied by his wife and four-year-old daughter Nawanjana, when, less than 100 metres from his destination, he was ambushed by two gunmen who opened fire at him at point-blank range, killing him instantly. Premakumara received three shots on his chest, while one of the bullets penetrated him and hit his daughter who was seated behind. His wife sustained a slight injury on her hand. In Kurukulawa, Ragama, Kelum Wijesiri, 31, also a money lender of the area, was shot dead inside his house on Tuesday night, after being confronted by 10 armed men.Wijesiri was a suspect in two murder cases in the Gampaha district, and was a resident of Weliweriya before relocating to Ragama. In a third killing of a money lender, Rohana Dissanayaka, of Ambepussa, a former soldier was found killed last Sunday, and his body partially burnt. 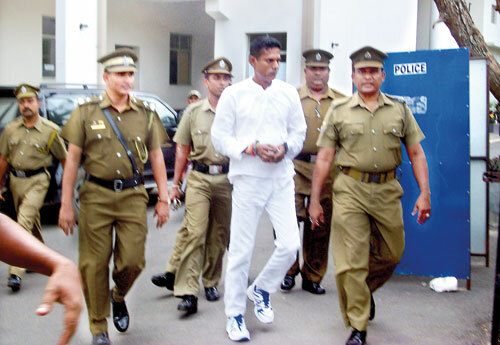 Rohana was a suspect in the shooting and wounding of a Samurdhi officer and had been released from remand custody last week. These killings in the Western Province has prompted the appointment of special police teams to investigate the rise of criminal armed gangs operating in the province, with Senior Deputy Inspector General of Police (DIG) Western Province Anura Senanayake in charge. Police are investigating whether the killings were related to the fact that they were involved in money lending or whether in the case of two of them it was their alleged criminal record.